Patriots special teamer and captain Matthew Slater was at Husson University last Friday night. 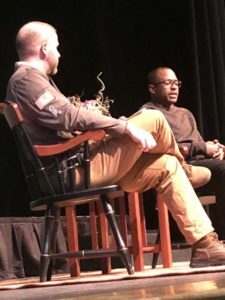 The five time pro bowler answered students’ questions in a Q and A event following the tough 37-31 Patriots loss in the Super Bowl to the Philadelphia Eagles in which coach Bill Belichick controversially decided to bench starting cornerback and former Super Bowl Hero Malcolm Butler. The seven-time special team pro-bowler was in good spirits during the meet and greet portion of the event. “Thank you for coming our small school,” I said. “No problem thanks for having me,” said Slater. Slater took photos and signed autographs to those students (including me) who purchased the VIP tickets. During the Q and A portion of the event, Slater was welcomed by Husson Student Activity director Sterling Pingree to a standing ovation from those in attendance. The Patriots captain also had a lot to say about the prior three Super Bowls he has been a part of. As for next year, Slater said that the current group of guys have more to prove. “You have a lot of guys who still feel they have to prove themselves in that locker room. 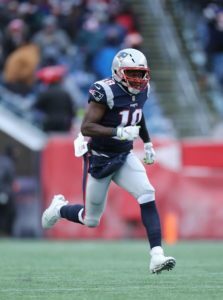 It remains to be seen what will happen with the draft but I think we have a good core of guys coming back,” said Slater. Slater also spoke about the competitiveness of quarterback Tom Brady. “We play tiddlywinks in the locker room and this guy will be up their cussing you out if you beat him,” said Slater. The event drew between between 230-250 people said Husson Student Activities director Sterling Pingree. This was the first event of the Q and A nature said Pingree when I talked to him following the ticket release. 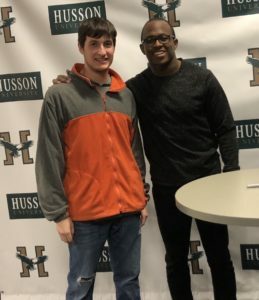 After the event, Slater, who had was making coffee in Massachusetts earlier in the day, stayed to take photos and videos with other Husson students. “I’ve been blessed, I need to give back to the community,” said Slater.